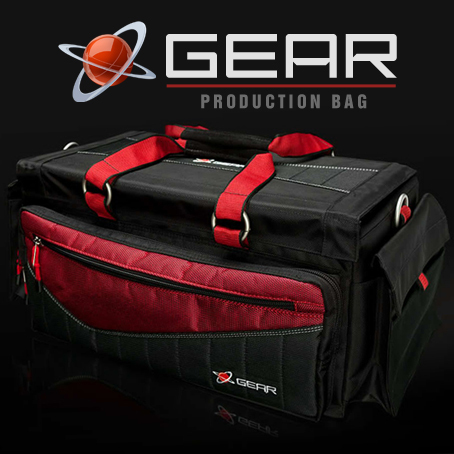 The Digital Juice Production Bag is an affordable shoulder camera production bag for photographers, videographers,etc in the new line of gear protection and transport equipment from Digital Juice. With the same sharp, professional look as our Topload Camera Bags, a fit and finish that outshines any bag on the market today and a set of must-have new features uniquely its own, this durable production bag offers stylish and organized storage for your DSLR cameras and other photography equipment and gear. 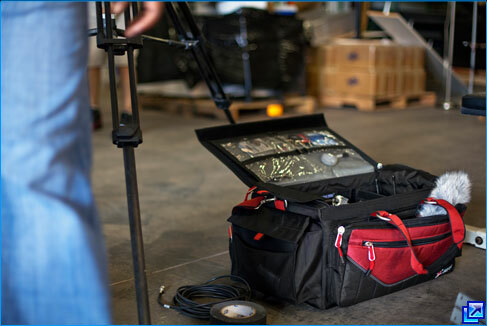 This compact, inexpensive, yet sturdy production camera bag offers protection for any and all types of broadcast, video or still camera gear and accessories. 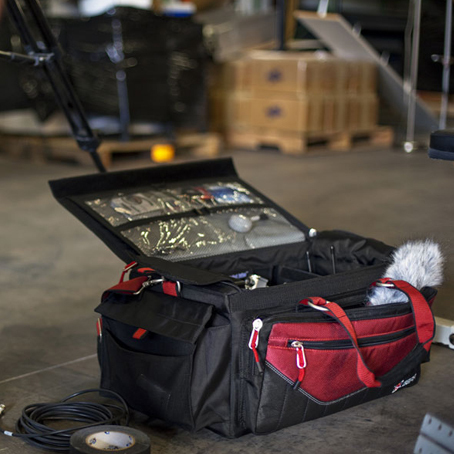 The high-quality materials, rugged construction, ease of use and 33 compartments of reconfigurable utility space make this nylon, shoulder production bag for camera gear another essential part of a photographer's complete production kit. While weighing on par with (or lighter than) other leading industry bags, the Digital Juice Production Bag is engineered without compromise on quality. 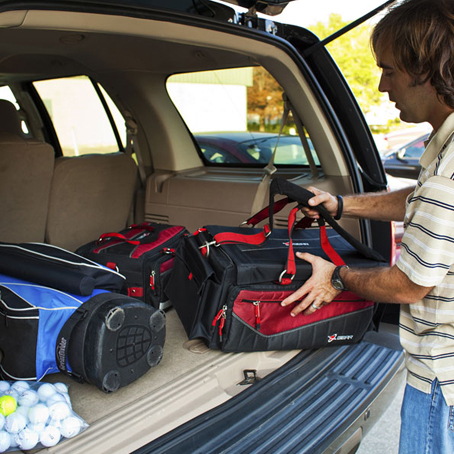 The durable lightweight plastic-reinforced frame provides flexible and stable protection in an easy-to-carry profile and allows the bag to be safely stacked or stored on top or under other bags without risk of damaging the gear inside. The easy access, horizontal topload lid is fully reinforced just like the frame of the bag. 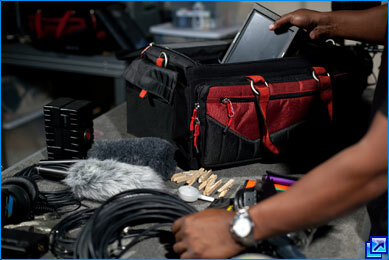 It can be zippered shut for transport, or held firmly closed with just Velcro on set. When you need something- it is easy to get to; when you are busy shooting- no dirt, water or other debris will easily get in to damage your equipment. Inside the production bag, four reconfigurable Velcro-attached pouches and an ample main compartment letting a photographer carry and protect a wide assortment of gear, keeping it organized so it won't move around in the bag while protecting it from the knocks and shakes of constant travel. 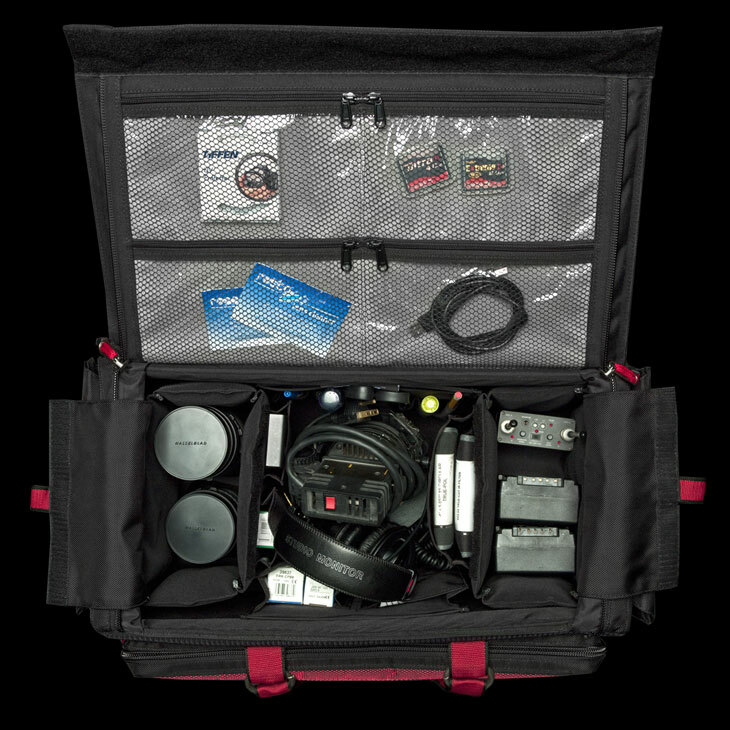 The two larger pouches can accommodate gear such as DSLR cameras, headphones, microphones, cables, tape, LCD monitors, audio recorders, lenses and grip clips, while the two smaller slimline pouches hold filters, memory cards, lens wipes and other small accessories you don't want to lose track of. 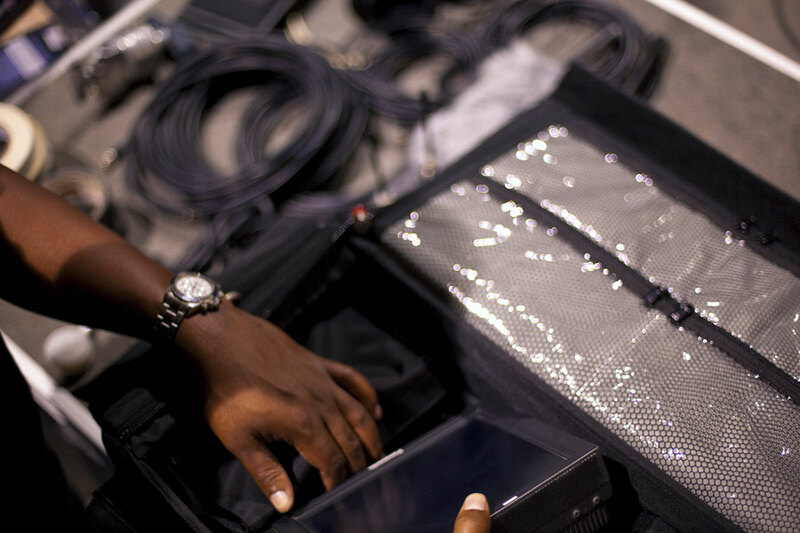 Sturdy construction materials means superior and longlasting protection for your production gear on the road and in the studio. 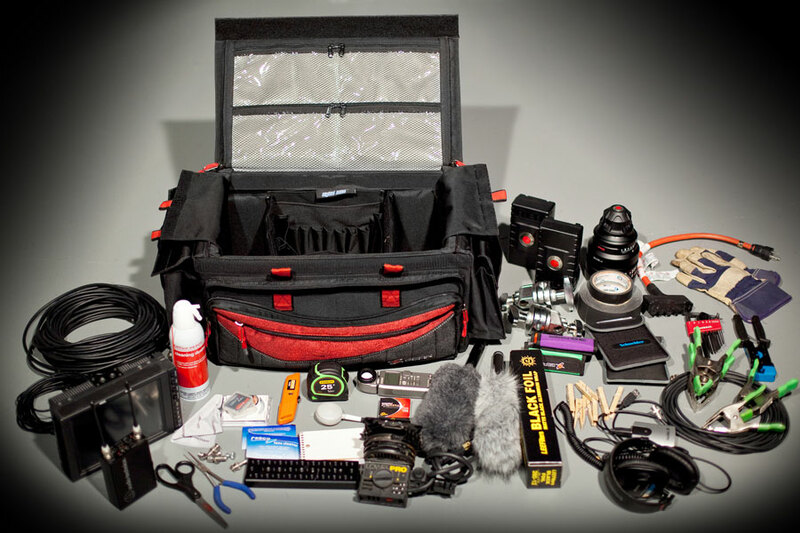 The Digital Juice Production Bag looks and acts professionally. Its unique styling and high quality construction will make it stand out, but its rugged functionality and ease of use will make it an essential part of your production kit. The Large Topload Camera Bag is of a similar size to this bag. How does this bag differ? The camera bag is a special purpose bag. Its primary use is for protecting camera equipment, with its secondary use being to provide for camera support accessories. 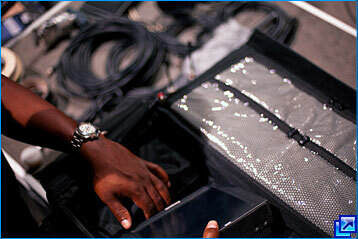 Our Production Bag was designed with storage and protection of all production related gear in mind. The individual padded pockets are designed to hold everything from the most delicate LCD confidence monitor, all the way down to a basic grip clamp. What might I expect to be able to tote in this bag? 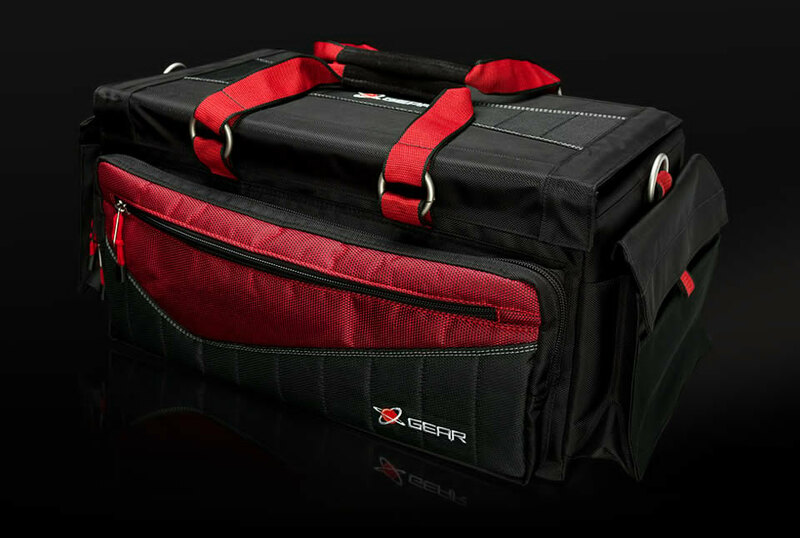 The beauty of this bag is that it can be configured to handle any large or small items. Any or all of the four Velcro pockets can be rearranged or removed to provide bracing or room for even the oddest shaped items. Are these bags for video or for photography? The Digital Juice Production Bag is perfectly comfortable in either setting. I notice some pictures feature handles and straps and some don't. Are these items optional? No. Both the detachable padded leather strap and the suede grip detachable handle set comes standard with the Digital Juice Production Bag. Although the fabric used is water resistant, it is best not to leave any of the Digital Juice Gear Bags exposed to inclement weather. Usually when something is engineered to a high level, the sacrifice is weight. How do these bags stack up to the competition? You can argue that the bag is, in fact, over-engineered for its recommended weight capacity. However, through careful material selection and frame specifications, the Digital Juice Production Bag's weight is on a par with, or even lighter than, other industry leading bags. 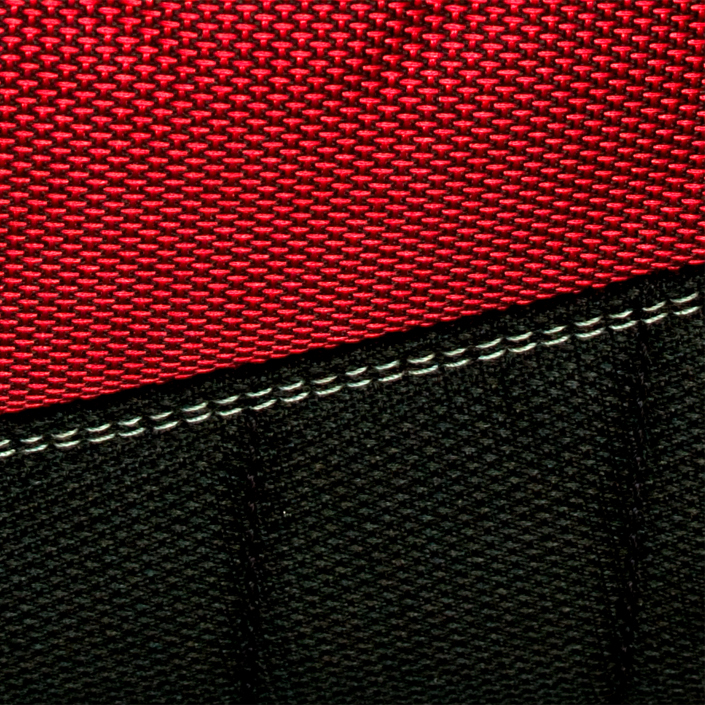 The heavyweight, nylon fabric used in the Digital Juice Production Bag gives this affordable camera bag excellent tear strength and is very abrasion resistant and durable. This stylish, compact production bag stands up to industry-standard Cordura in every real-world test. Plus, the polyurethane coating provides a waterproof layer between your gear and the elements so you can breathe easy and be assured your equipment will be safe when you travel. The 5mm plastic sun board used to reinforce the base and top zippered lid is impact resistant and free from heavy metals. It provides lightweight, sturdy protection, additional water resistance and stackability. 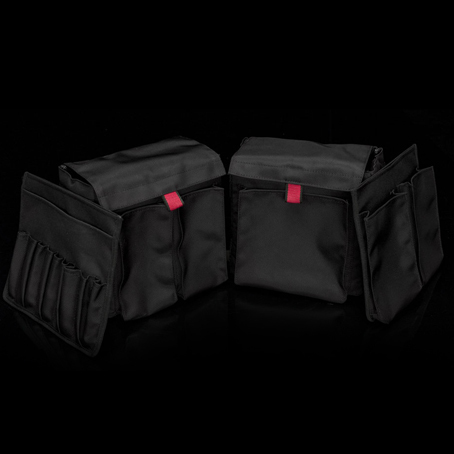 When combined with the bag frame's 3/8" closed cell foam padding, it insures your gear will be well protected. 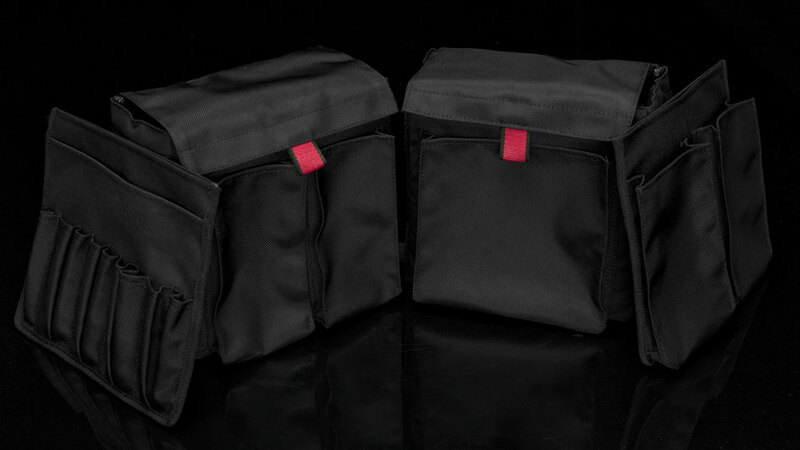 The four Velcro-attached interior pouches provide soft reconfigurable protection and organization for your gear. Each pouch has a different configuration of utility pockets so you can keep any type of accessory from moving around within the bag, while protecting it from the elements and from damaging your other gear. The sturdy reinforced horizontal topload flap lid unzips, opens wide and folds back out of the way for easy access to the contents of the bag. 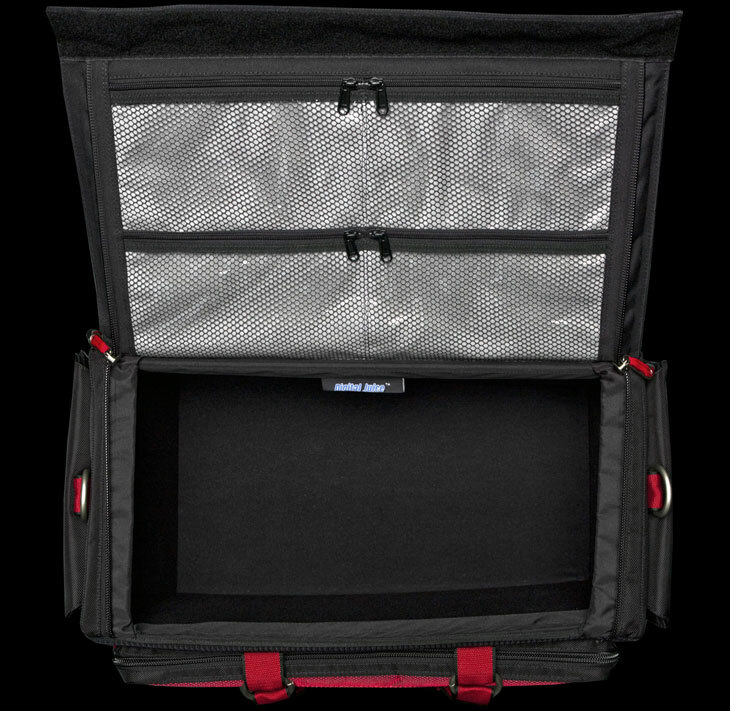 The four mesh laminated zipper pockets on the inside of the top lid flap provide quick and visible access to small items such as filters, lens wipes, memory cards and tools. 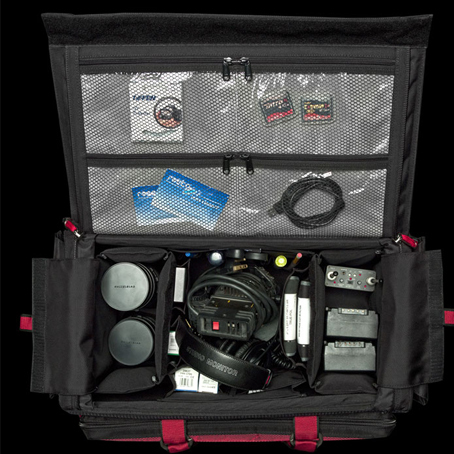 A total of 33 compartments in a variety of unique and flexible storage pockets allows ample space for batteries, tape, media cards, headphones, hard drives, lenses, cables, LCD monitors, wireless mics, sound recorders and notebooks. 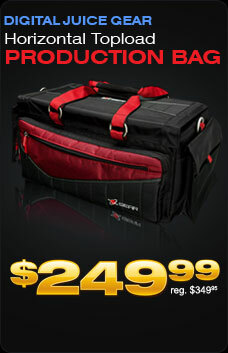 Just about any production accessory you may need to store or bring along can be easily carried in these bags. Flapped pocket on side of bag lets you add your business card for easy identification. Whether in the studio or on location, the Digital Juice Production Bag is designed to protect and transport your production gear while looking professional and stylish. 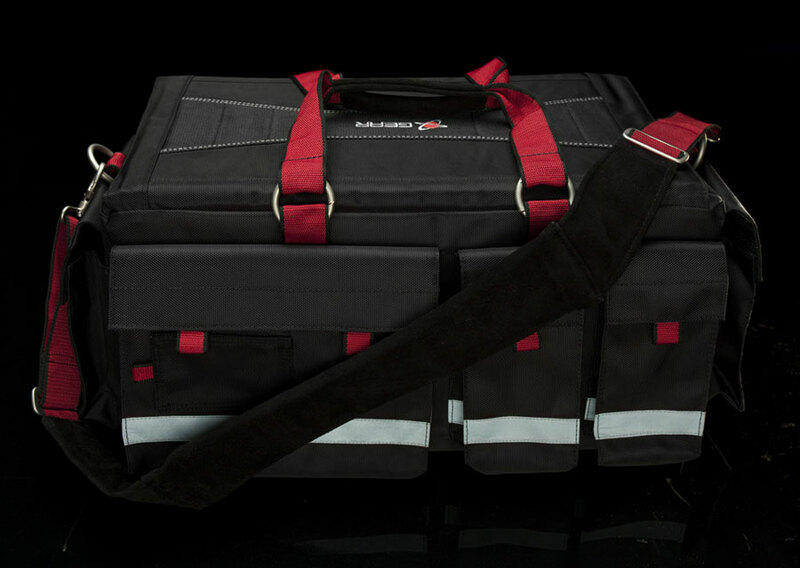 The light weight and sturdy construction of this bag means you can carry as much equipment with you as you need without worrying about being overburdened or damaging your gear. Interior Dimensions of 19.75" x 10.75" x 9.75" and Exterior Dimension of 23" x 14" x 11.5"
Exterior is constructed and sewn with sturdy nylon thread, rugged waterproof nylon fabric, thick nylon web straps, heavyweight YKK zippers, strong woven nylon cord pulls, and soft suede handle grips Sturdy construction materials means superior and longlasting protection for your production gear on the road and in the studio. Casual good-looking style with pro-level function and performance The Digital Juice Production Bag looks and acts professionally. 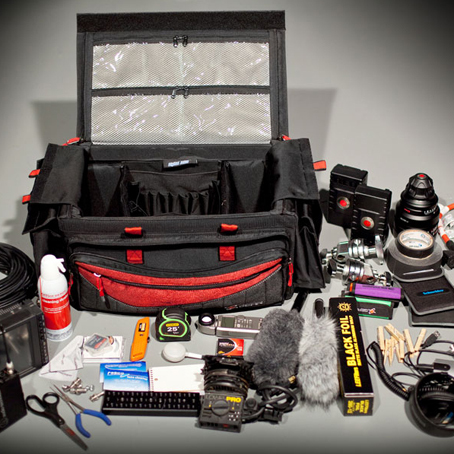 Its unique styling and high quality construction will make it stand out, but its rugged functionality and ease of use will make it an essential part of your production kit.